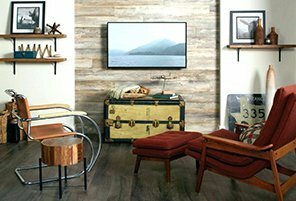 There is no denying that it’s hard to keep up with the latest and greatest decor trends. After some in-depth research and consulting with a few design experts, I’ve compiled a list of 10 popular decor trends that you can expect to see in 2019. When it comes to neutral tones, the options are seriously endless. The muted hues go far beyond pearls and beiges, with so many legitimate ways to stand out while blending in. 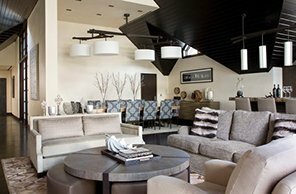 In addition, neutral colors are timeless and work in practically all spaces. The popularity of neutrals will always resurface and never fully disappear. Curvy furniture is making the rounds filling that niche between modern and feminine. Studies show that curvy furniture evokes feelings of relaxation and hope. Some of the top designers have started adding curvy pieces to their new 2019 collections, so stay on the lookout for some fun and inviting shapes. There is something to be said for a white kitchen, who doesn’t love the brightness and inviting feel of white? But there is a new tone in town and it’s on the opposite end of the spectrum. 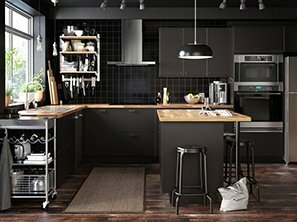 There is a case to be made for the sleek look that a black kitchen offers. Black mixed with light wood feels sophisticated and modern. Flat black tiles pair well with any color cabinetry. Tiles are one of few design elements of a home that can completely transform a space. Whether used on the floors, walls of the bathroom, or as a backsplash in the kitchen. In 2019 the tile trend that is a true standout material, would undoubtedly be terrazzo. 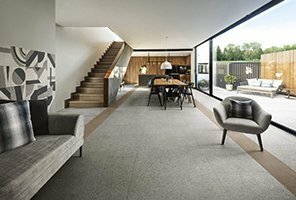 The use of terrazzo in both tile and furniture design is on the rise. Together well with the new retro flare that has a Seventies twist that is currently surfacing at the shows. 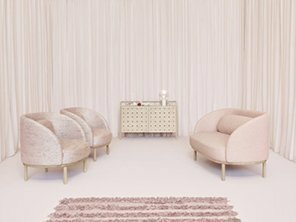 The observation was clear in the soft shades and big structures of the latest furniture collections displayed. While pink is not neutral in any sense of the word, it has tremendous versatility when it comes to combining with other colors ranging from blue and green to red and yellow. The countless shades of pink also allow you to use it in living rooms of varied styles and themes. A recent New York Times report pointed out that there’s a growing demand for showers for dogs in homes. That’s right, dog showers. 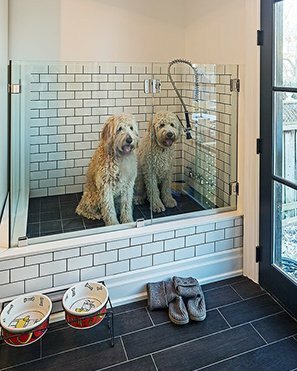 Instead of giving your dog a bath in the regular tub, some homeowners are opting to build a separate shower for their dog. As excessive as it might sound, it does make sense. Mixed Metals are still considered key materials for accents, especially when mixed with patterns and textures. Clients always ask about mixing metals, not only can you mix metals in your home décor, but mixed metals will be one of the hottest interior design trends of 2019. The mixed metal trend involves using a combination of different metal accents (i.e. silver with gold, brass with stainless steel) in a single room. Green has been a trend for a few years now, and 2019 isn’t looking any different, green will continue to be big in 2019! The revamp of green feels fresh and organic. 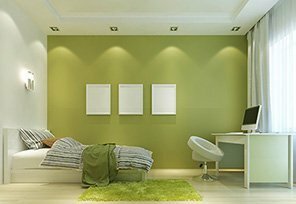 Although you will see a spectrum of greens this year, there are two shades that are predicted more significant – sage green and emerald green. Changing a wall in your room always adds contrast, and having two different materials is incredibly appealing, even if you stay in the same tones. You can change a wall as simple as just choosing a different paint color, or you could add designs and/or patterns that will make it more interesting. 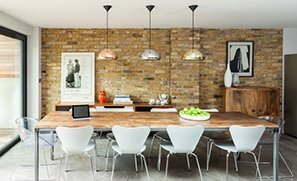 Paint is a budget friendly option but if you really want to get that wow effect you could add a layer of woods planks or even a mural. 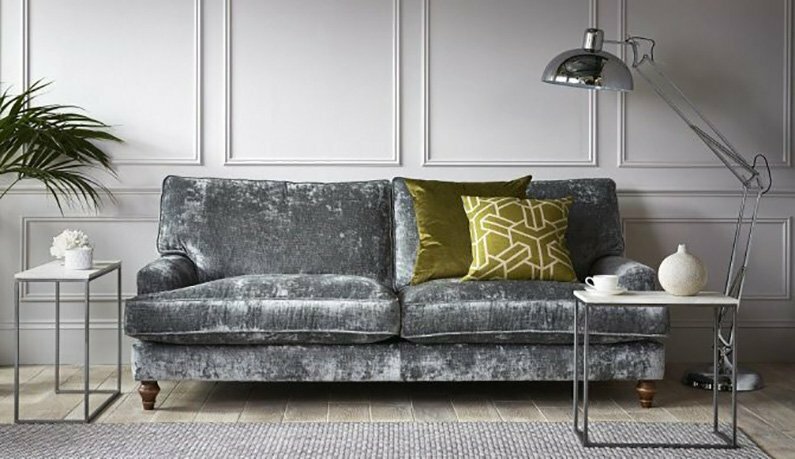 Velvet has often been considered as old fashion, but in 2019 velvet is making a revival. Now viewed as a luxurious, yet edgy option. 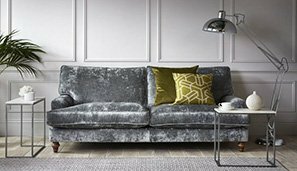 This multi-dimensional fabric is definitely gaining a lot of attention, leading many designers to believe velvet decor will be one of 2019’s most sought-after trends.